The GRIP (golgin-97, RanBP2alpha,Imh1p and p230/golgin-245) domain [(PUBMED:10209120), (PUBMED:10209123), (PUBMED:10209125)] is found in many large coiled-coil proteins. It has been shown to be sufficient for targeting to the Golgi [(PUBMED:14580338)]. The GRIP domain contains a completely conserved tyrosine residue. There are 2004 Grip domains in 2002 proteins in SMART's nrdb database. Taxonomic distribution of proteins containing Grip domain. This tree includes only several representative species. The complete taxonomic breakdown of all proteins with Grip domain is also avaliable. Click on the protein counts, or double click on taxonomic names to display all proteins containing Grip domain in the selected taxonomic class. 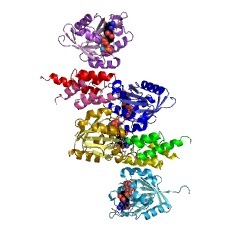 Structural basis for recruitment of GRIP domain golgin-245 by small GTPase Arl1. Recruitment of the GRIP domain golgins to the trans-Golgi network is mediated by Arl1, a member of the ARF/Arl small GTPase family, through interaction between their GRIP domains and Arl1-GTP. The crystal structure of Arl1-GTP in complex with the GRIP domain of golgin-245 shows that Arl1-GTP interacts with the GRIP domain predominantly in a hydrophobic manner, with the switch II region conferring the main recognition surface. The involvement of the switch and interswitch regions in the interaction between Arl1-GTP and GRIP accounts for the specificity of GRIP domain for Arl1-GTP. Mutations that abolished the Arl1-mediated Golgi localization of GRIP domain golgins have been mapped on the interface between Arl1-GTP and GRIP. Notably, the GRIP domain forms a homodimer in which each subunit interacts separately with one Arl1-GTP. Mutations disrupting the GRIP domain dimerization also abrogated its Golgi targeting, suggesting that the dimeric form of GRIP domain is a functional unit. 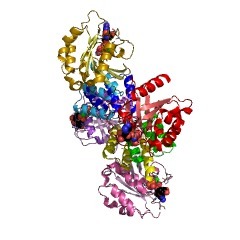 The GRIP domain - a novel Golgi-targeting domain found in several coiled-coil proteins. Many large coiled-coil proteins are being found associated peripherally with the cytoplasmic face of the organelles of the secretory pathway. Various roles have been proposed for these proteins, including the docking of donor vesicles or organelles to an acceptor organelle prior to fusion, and, in the case of the Golgi apparatus, the stacking of the cisternae     . Such critical roles require accurate recruitment to the correct organelle. For the endosomal coiled-coil protein EEA1, targeting requires a carboxy-terminal FYVE domain, which interacts with Rab5 and phosphatidylinositol 3-phosphate (PI(3)P), whereas the Golgi protein GM130 interacts with Golgi membranes via the protein GRASP65   . In this paper, we show that two other mammalian Golgi coiled-coil proteins, golgin-245/p230 and golgin-97, have a conserved domain of about 50 amino acids at their carboxyl termini. This 'GRIP' domain is also found at the carboxyl terminus of several other large coiled-coiled proteins of unknown function, including two human proteins and proteins in the genomes of Caenorhabditis elegans and yeasts. The GRIP domains from several of these proteins, including that from the yeast protein Imh1p, were sufficient to specify Golgi targeting in mammalian cells when fused to green fluorescent protein (GFP). This result suggests that this small domain functions to recruit specific coiled-coil proteins to the Golgi by recognising a determinant that has been well conserved in eukaryotic evolution.